"What else did I do today? I went to Blockbuster, bought three DVDs and then from noon to 4:30, I opened them using only an exacto knife and a jaws of life I borrowed from an ambulance team. You know, it's now actually easier to break into films than to break into their packaging." For practically all of my adolescence into the first years of my so-called adulthood, I felt I knew too much about pop culture, you know? Taking obscure bits from movies, television shows, news stories and so on, applying them to conversation to the delighted amusement of those who "got" it and the befuddlement of, well, the majority of the world. For example, while on the job one night, a humorous co-worker was acting more animated than usual. So, I turned to my friend and said, the "real" Stan must be "on the other side of the island." Of course, you all know that was a reference to a classic episode of Gilligan's Island. What? Okay, I'm counting the hands of one, two... well, some of you "got" that. You mean the lion's share of you out there reading couldn't recognize a reference to the greatest artistic achievement to ever grace the tube? My stars! Now, do you see the personal torture I've been privy to? Well, right around that point in time, a new face was gracing the anchor desk at NBC's Saturday Night Live. He was an unconventional sort, not really comfortable in sketches (as one can attest to his barely suppressed embarrassment in those that bombed big time, particularly during his early days on the show). But upon invading that rinky-dink news set around 11:10 CST every Saturday eve, the Pittsburgh native became a totally different animal. Full of snide asides on current events, witty barbs hurled at justifiable media targets and arcane pop culture references (I WAS NOT ALONE!) accompanied by an impressive use of the English language that had some of us blowing dust off our dictionaries, Miller was the best thing to happen to Lorne Michaels' late night institution since Eddie Murphy departed for Tinseltown. So, given my bordering-on-gushing admiration for his talents (with many a classic episode of Dennis Miller Live supplemented by a complete library of companion rant books as evidence), why did I find the digital debut of his most recent HBO project, Dennis Miller: The Raw Feed to be somewhat of a disappointment? Well, for one, I've never held his stand-up abilities in high regard (I can't even remember his turn on Star Search for crying out loud). A somewhat private man offstage, he's never been one to tap the well of family life for monologue material often (no "Wanna hear what my kids did today" from this guy), so with personal happenings off limits, what else is there to talk about but topical world events, which you would think, in Miller's case, would be a "can't miss," right? Well, maybe I've been spoiled by the format of his late, great cable show, but The Raw Feed left me feeling like I just watched the visual equivalent of a mix tape comprised mostly of filler tracks from a greatest hits album. Although not without a truckload of headline material to work with (North Korea, global warming, California politics, profiling, etc. ), Miller's the type of humorist that works best when given a sufficient amount of time to go full throttle on a subject, wringing every last drop of potential verbal H20 laugh-worthy material from a topical rag (this guy didn't win a truckload of Emmys for nothing). But in the traditional one-hour comedy specials, one can't afford to riff on a single topic for more than a few minutes; there has to be variety—things have to keep moving—and in this case, that's a detriment. One example comes when the subject of the recent troubles in the Catholic Church comes up ("I went to confession the other day and I said, you first"), material just aching for full-on treatment. And just when you think Miller's about to go for the jugular (preach it, Dennis!) following some brilliant one-liners, he's off to the Middle East. Another problem is that specials of this type sometimes tend to have a shelf life that expires quicker than the milk in your fridge. Even though Feed only dates back to March of this year, haven't we forgiven the French already for their pre-Iraq War stance? Or do most of us even remember or, better yet, even care? Such moments tend to lessen the effectiveness of the material in retrospect. Also, I had to snicker rather than laugh when Miller shot verbal darts at Bill Clinton (and Hillary, too) after declaring his admiration for President Bush and support of the (then impending) war in Iraq (and although I don't want to get off on a political rant here, the pro-Bush bit made me wince, to be honest). Seems like only yesterday I remember the comedian being incredibly sympathetic to the former Arkansas governor while conversing with Jay Leno on The Tonight Show. Then again, to be fair, I suppose Dennis is no different than the rest of us when it comes to the ever-changing barometer of individual public opinion; in fact, I wonder what Miller thinks of our current Commander-in-Chief some five months post Raw, after he declared a so-called end to "major combat" in front of a worldwide television audience from the deck of an aircraft carrier, looking like a substitute host on a Bob Hope special, where all that was missing were cameos from Ann Jillian and Brooke Shields? But, hey. It's just my opinion, I could be wrong. Image Transfer Review: Absolutely beautiful, babe. Most certainly recorded with high-definition cameras, its like you're almost watching a live broadcast. Colors are natural, right on the money, showcasing everything from the beautiful confines of the Windy City's luxurious Vic Theater to Denny's snazzy suit perfectly. The definition of a perfect transfer job in keeping with HBO's commitment to high standards and levels of excellence. Yeah, I'm bucking for free cable. Audio Transfer Review: The transfer is not bad, but I was annoyed with the overcranked surrounds that got to be as aggravating as a laugh track on a bad sitcom; in fact, to make the experience more tolerable, I actually had to turn my rears down a couple of notches. The mix could have been better had more audience ambience been ported over to the fronts, but that's just my opinion (all together now, kiddies), I could be wrong. Extras Review: Hey, a "pop culture guide for dummies" would have been the ticket, huh? But other than the soon to be extinct chapter sheet insert, that's it, pal. 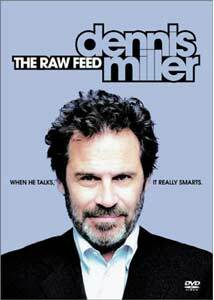 Although it possesses glimmers of what made his classic HBO series so unique and special, Dennis Miller: The Raw Feed suffers from the comedian attempting to cover too many topics in a short amount of time, a few bits that miss, and more than one instance of material that's lost its punch in between its original airing and DVD homecoming. Still, the stellar visuals and occasional gut-busting laughs that stick are worth at least a rental for Millerheads.